“Unsung Heroes: A Grand Celebration of Latinx and Black Resilience” will be held on Sunday, October 30 at 3 pm at UNC Asheville’s Lipinsky Auditorium. This celebration is free and open to the public. 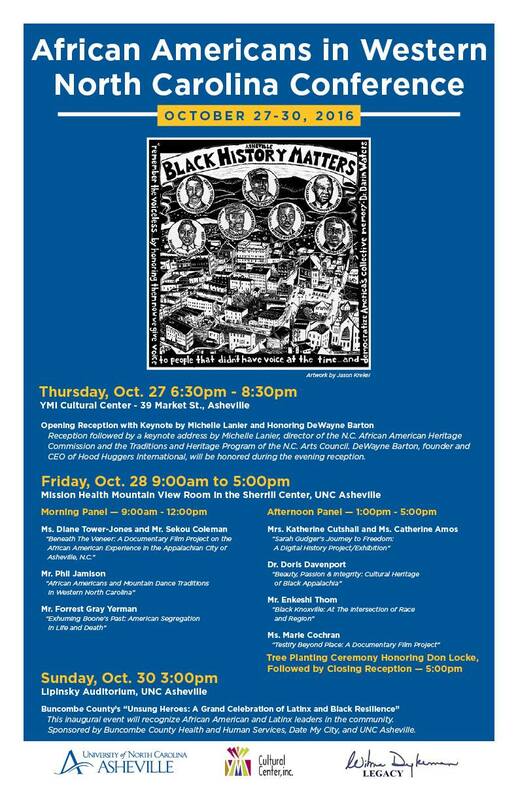 Unsung Heroes is the culminating event of UNC Asheville’s African Americans in WNC Conference, which begins on Thursday, October 27. We are inviting the entire community to join us in celebrating not only these identified heroes but also to come together, to connect and align our efforts as we move toward a more resilient community. We have so much to be thankful for in our community and we know that there is great potential when we work together, recognizing what each of us has to offer. Attendees will leave Unsung Heroes uplifted and ready to access the extensive network of resources our community has to offer. Keyla Estrada immigrated to the United States from Mexico in 2015. A senior at Erwin High School, she is now a leader in the Nuestras Escuelas/Our Schools campaign and an instructor of traditional dance and Spanish language literacy with the RAICES program. David Forbes, founder of the Asheville Blade, advocates relentlessly and unapologetically for marginalized communities through the powerful medium of journalism. Oskar Santana (DJ Malinalli) is a DJ who supports community, grassroots organizations, and social justice movements through his work as an artist and entertainer. Kathy Avery is an Registered Nurse for the Asheville Buncombe Institute for Parity Achievement (ABIPA), who works with vulnerable populations providing health services and education. Eric Howell began as a student at Green Opportunities after making the decision to turn his life around. He is now an instructor and math tutor for the program. Maria del Rosario Segovia Salas, Ricardo Segovia Salas, Patricia Guerra, Bruno Hinojosa, Maria Ruiz, Rosalba Cruz, Abel Gonzalez are member-owners of Dulce Lomita. This LLC is a resident owned and governed mobile home park, and is working on creating a shareable model to prevent displacement of mobile home residents. Priscilla Ndiaye has performed extensive research on the black community when information and scholarship seemed scarce. She researched, wrote, protested and continues to advocate for difficult issues using history as her framework. Rosalia (Rosy) del Carmen Islas is a healer and spiritual guide who tirelessly holds space for the Latinx community’s continued healing and spiritual wellness. John Hayes has served the Asheville community since 1977 through the Hillcrest Enrichment Program, Hillcrest High-steppers Majorette and Drum Corp, the NAACP, the Empowerment Resource Center, and WRES 100.7 FM. Lucia Hernandez has been an instructor for RAICES since the beginning of the program. She holds an important place in the Latinx community as a mother and grandmother figure, because many families have been separated from their elders due to migration. If you have questions about Unsung Heroes, email unsungavl@gmail.com. This event is sponsored by Buncombe County. Friday, Oct. 28 [9 am to 5 pm] will feature panel discussions in UNC Asheville’s Sherrill Center, as well as invited presentations introducing two documentary film projects. The films will include Beneath the Veneer, which explores race, class and income mobility by taking a glimpse beneath the veneer of life in a progressive, affluent, Southern city as seen through the eyes of its “invisible black boys,” and Testify Beyond Place, a documentary film that pays homage to the Mount Zion AME Zion Church and its relationship to Western Carolina University. UNC Asheville also will plant and dedicate a tree in memory of Don Locke, at 5:15 p.m. at Karpen Garden on campus. Locke, an author, education advocate and longtime champion for diversity, served as director of Diversity and Multiculturalism at UNC Asheville. This awareness is SO important if we are to make Asheville more inclusive. Relevant to anyone with a public space they are a part of – store, church, art gallery, etc…. Firestorm Books & Cafe is the only remaining bookstore collective in the Southeast. They provide a righteous space for a ton of kickass stuff, offering free events and supporting grassroots organizations. They are currently on tenuous ground. Click here to read about becoming a Firestorm sustainer to support this vital resource. Once again, there are so many positive and important things happening in Asheville related to justice and transformation – I capture just a fraction of them here. Let me also say you can stay tuned for a first person post soon, I am overdue on sharing more of what’s in my head with you all. Next Next post: Community. Collaboration. Commitment.